For other uses, see Wallaby (disambiguation). A wallaby is a small- or mid-sized macropod native to Australia and New Guinea, with introduced populations in New Zealand, UK and other countries. They belong to the same taxonomic family as kangaroos and sometimes the same genus, but kangaroos are specifically categorised into the six largest species of the family. The term wallaby is an informal designation generally used for any macropod that is smaller than a kangaroo or wallaroo that has not been designated otherwise. The name wallaby comes from Dharug walabi or waliba. Young wallabies are known as "joeys", like many other marsupials. Adult male wallabies are referred to as "bucks", "boomers", or "jacks". 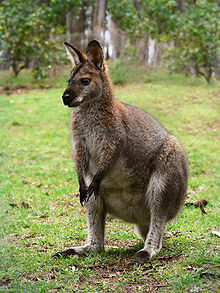 An adult female wallaby is known as a "doe", "flyer", or "jill". A group of wallabies is called a "court", "mob", or "troupe". Forest-dwelling wallabies are known as "pademelons" (genus Thylogale) and "dorcopsises" (genera Dorcopsis and Dorcopsulus). Although members of most wallaby species are small, some can grow up to approximately two metres in length (from head to end of tail). Their powerful hind legs are not only used for bounding at high speeds and jumping great heights, but also to administer vigorous kicks to fend off potential predators. The Tammar wallaby (Macropus eugenii) has elastic storage in the ankle extensor tendons, without which the animal's metabolic rate might be 30–50% greater. It has also been found that the design of spring-like tendon energy savings and economical muscle force generation is key for the two distal muscle–tendon units of the Tammar wallaby (Macropus-Eugenii). Wallabies also have a powerful tail that is used mostly for balance and support. Wallabies are herbivores whose diet consists of a wide range of grasses, vegetables, leaves and other foliage. Due to recent urbanization, many wallabies now feed in rural and urban areas. Wallabies cover vast distances for food and water, which is often scarce in their environment. Mobs of wallabies often congregate around the same water hole during the dry season. Wallabies face several threats. Wild dogs, foxes, and feral cats are among their predators. Humans also pose a significant threat to wallabies due to increased interaction (wallabies can defend themselves with hard kicks, and biting). Many wallabies have been involved in vehicular accidents as they often feed near roads and urban areas. Wallabies are widely distributed across Australia, particularly in more remote, heavily timbered, or rugged areas, less so on the great semi-arid plains that are better suited to the larger, leaner, and more fleet-footed kangaroos. They also can be found on the island of New Guinea. Kawau Island in New Zealand is home to large numbers of tammar, Parma, swamp and brush-tailed rock-wallaby from introductions made around 1870. They are considered a pest on the island, but a programme to re-introduce them to Australia has met with only limited success. The Lake Tarawera area of New Zealand has a large tammar population. The South Canterbury district of New Zealand has a large population of Bennett's wallaby. On the Isle of Man in the Ballaugh Curraghs area, there is a population of over 100 red-necked wallabies, descended from a pair that escaped from the nearby Curraghs Wildlife Park in 1970. Hawaii has a small non-native population of wallabies in the upper regions of Kalihi Valley of the island of Oahu arising from an escape of zoo specimens of brush-tailed rock-wallaby (Petrogale penicillata) in 1916. In the Peak District of England, a population was established in around 1940 by five escapees from a local zoo, and as of September 2017 sightings were still being made in the area. At its peak in 1975 the population numbered around sixty individuals. The island of Inchconnachan in Loch Lomond, Scotland, has a population of around 28 red-necked wallabies introduced by Lady Colquhoun in the 1920s. Eradication to protect the native capercaillie has been proposed. There is also a small population on Lambay Island off the east coast of Ireland. Initially introduced in the 1950s and 1960s, more were introduced in the 1980s after a sudden population explosion at Dublin Zoo. Populations in the United Kingdom that, for some periods, bred successfully included one near Teignmouth, Devon, another in the Ashdown Forest, East Sussex and one on the island of Bute and Lundy. It has recently been reported by walkers in the Lickey Hills Country Park area of Birmingham that a pair of wallabies have been released or are loose there (East Tunnock Rambling Club Meeting, December 2010). In France, in the southern part of the Forest of Rambouillet, about 50 km (30 mi) west of Paris, there is a wild group of around 30 Bennett's wallabies. This population has been present since the 1970s, when some individuals escaped from the zoological park of Émancé after a storm. The swamp wallaby is the only living representative of the genus Wallabia. This individual exhibits the species' unusual preference for browsing; note the use of the forelimbs to grasp the plant. The term "wallaby" is not well defined and can mean any macropod of moderate or small size. Therefore, the listing below is arbitrary and taken from the complete list of macropods. ^ (DOC), corporatename = New Zealand Department of Conservation. "Wallabies". www.doc.govt.nz. Retrieved 18 June 2018. ^ "The Kangaroo". australianwildlife.com.au. Retrieved 6 November 2013. ^ "Wallaby". Encyclopædia Britannica. Retrieved 17 January 2015. ^ Biewener, A. A.; Baudinette, R. V. (September 1995). "In vivo muscle force and elastic energy storage during steady-speed hopping of tammar wallabies (Macropus eugenii)" (PDF). Journal of Experimental Biology. 198 (9): 1829–1841. ^ "Searching for the Isle of Man's wild wallabies". BBC. 17 October 2010. Retrieved 23 March 2013. ^ "Earlham College – Biology Department – Introduced Species In Hawaii – Mammals". Earlham.edu. 9 December 1959. Retrieved 23 March 2013. ^ Yalden, D. W.; Hosey, G. R. (2009). "Wallabies in the Peak District". Journal of Zoology. 165 (4): 513. doi:10.1111/j.1469-7998.1971.tb02203.x. ^ "Wallabies and yaks". The Roaches Peak District, Roaches.org.uk. Retrieved 23 March 2013. ^ "Loch Lomond Islands: Inchconnachan". Loch Lomond.net. Retrieved 24 August 2007. ^ "Scottish Daily Record, 06/06/2009 Colony of Wallabies set for cull". Daily Record. Scotland. 6 June 2009. Retrieved 23 March 2013. ^ Goodwin, David (16 June 2009). "The Scottish Sun Wallabies butchered". The Sun. United Kingdom. Retrieved 23 March 2013. ^ McLean, Marc (5 June 2009). "Wallabies face being wiped out". Lennoxherald.co.uk. Retrieved 23 March 2013. ^ Dolan, Brian (8 July 2010). "Archaeological Wallabies on Lambay Island". seandalaiocht.com. ^ Connally, Colleen (12 November 2014). 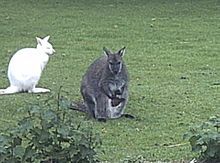 "What the Heck Are Wallabies Doing in Ireland?". smithsonianmag.com. Look up wallaby in Wiktionary, the free dictionary. View the macEug2 genome assembly in the UCSC Genome Browser. This page was last edited on 7 April 2019, at 04:49 (UTC).